Nobody likes bugs. Whether they’re in your home or ruining a good time outside, they need to be dealt with. Heritage Perimeter Pest & Mosquito Control in Kansas City keeps bugs outside where they belong. We can control fleas, ticks and other outdoor insects by spraying your lawn. We also have a perimeter pest control program we call our Bug Barrier. Combine the Bug Barrier with our Perimeter Pest & Mosquito Control and your exposure to bugs will be greatly reduced. The best way to keep bugs out of your home is to kill them before they get in. With our Bug Barrier Treatment, that’s just what we do. We spray the outside of your home every couple of months to keep any new bugs away. We use slow-acting chemicals that stay potent longer so bugs carry it back to their nests allowing it to kill them all. It’s a comprehensive, and complete solution. After the first treatment , you don’t even have to be home. It’s easy, effective and convenient – all the things you want in a pest control program. If you’ve got pets, you know they can get fleas and ticks outside and bring them inside. Don’t worry. Heritage has a Flea and Tick Treatment solution for that too. We can treat your entire lawn for fleas and ticks so when Fido goes outside, he comes inside alone. It works on chiggers too. In fact, if you’re planning an outside party, call us for a pre-treatment and enjoy the outdoors without being eaten alive. 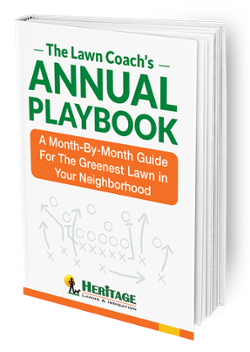 No matter where the pests are, inside or out, Heritage Lawns & Irrigation has a pest control solution for you. So bug us when you’re tired of being bugged. We’ll be right over. Disclaimer: Does not include termite control. To schedule Pest Control Services, call (913) 451-4664 or fill out the form to the right and we’ll call you to set the appointment.